We have likely all seen the bumper sticker or heard the phrase “think globally, act locally” but human nature sometimes makes that difficult. Despite NOAA, NASA, the Japanese Meteorological Agency, and the UK Met Office all stating that 2014 was the warmest year on record, it has been colder than normal where I live as depicted in the picture above. This localized cold sometimes makes conversations about climate change and our warming planet more challenging. In addition, people who live in the upper Midwest of the U.S. sometimes take to the opinion that a few degrees warmer sure would be nice and it is less expensive than moving to Kansas. Ironically, if our planet was just 7 degrees colder those of us in the upper latitudes would be under a mile of ice. Looking at the data above, helps get back to seeing a good depiction of a global problem. While in the upper Midwest we might have been fighting a polar vortex that caused school closings and travel restrictions, many other areas throughout the globe were fighting record heat and drought in 2014. It is even more important to look at long term trends as depicted in the chart below taken from a data query I did on the NOAA website. It is disheartening to know that every year my children have been alive, global temperatures have been above historical averages. 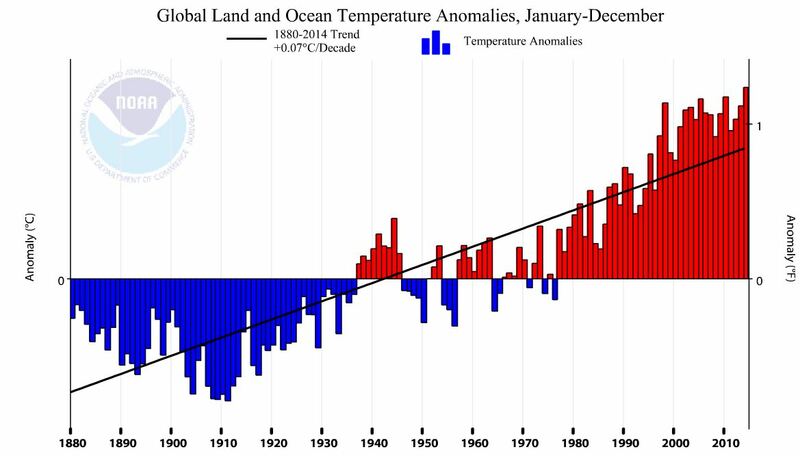 December 2014 was the 358th consecutive month where global temperatures were above average. In addition, 13 of the hottest years on record (since 1880) have been in the last 15 years. The scientific consensus on whether the warming is manmade or not is overwhelming everywhere except the U.S. Senate and the U.S. media. All 38 National Academies of Science agree, the hundreds of AMS organizations all agree, and peer reviewed scientific articles have outnumbered those opposed 500:1 for over 20 years. What if we change our mindset to align with the former chief economist of the World Bank (Sir Nicholas Stern) and many others who view this problem as a market failure? After all, we typically do not let industries dump their garbage and toxins for free. A market failure is when costs are shifted to non-users and that is precisely what has happened here. In one way or another, everyone is currently paying for carbon regardless of their usage. Typically when markets fail, governments intervene in one of four ways: R&D, Subsidies, Regulation, or Taxes. R&D is great but in reality we already have the technology and knowledge needed though continued improvements in efficiency will help. Subsidies help but they are expensive and not politically viable, with little ROI. Regulation is good by forcing more fuel efficiency and standards on emissions, but that is quite simply not enough to move the needle significantly. And everyone hates to talk about taxes, though that is exactly what is needed here. The Citizens Climate Lobby is advocating a $10 / ton tax on CO2 with that increasing $10 each year for 20 years. To put that in perspective, in year one it would be ~10 cents per gallon at the pump and ~1.2 cents per kWh for electricity. The beauty of their proposal is that it would be 100% revenue neutral, meaning all of the tax revenue would be returned to American households equally without the government keeping anything. Imagine you, me, and Keith Hernandez all getting a monthly dividend check for the same amount. This type of tax would be a light switch moment, immediately shifting behaviors and decisions of consumers. In the past year gay marriage had a light switch moment and though there are a few states with their hand still on the dimmer switch, tremendous progress has been made. Eliminating our reliance on fossil fuels needs a similar moment to give it momentum and move us forward. So this brings us back to thinking globally and acting locally. If you are reading this, you have much to be grateful for in terms of being born where and when you were and more. Understand that our lifestyle and choices have impacts on the planet as a whole and small iterative changes can have large impacts when multiplied by billions of people. As John Muir said, “When one tugs at a single thing in nature, he finds it attached to the rest of the world”. I encourage you to investigate joining one of the CCL’s weekly intro calls to learn more how you can help our elected leaders respond to our citizens political will. This entry was posted in Earth and tagged act locally, carbon tax, CCL, Citizens Climate Lobby, climate change, economist, emissions, fossil fuels, Global warming, ice age, Japanese Meteorological Agency, John Muir, Keith Hernandez, market failure, NASA, NOAA, polar vortex, Sir Nicholas Stern, temperature, think globally, UK Met Office, World Bank.